My son was returning. It had been almost three years since He was last home, and His closest friends have told me He has a longing to once more walk the dusty paths and winding ways of His childhood and youth. Some might call it homesickness-- and they would be partially right--but I know this longing speaks of more than homesickness. You see, for the last several years He has spent His days and nights as a sort of migrant. Never really knowing where He will next lay His head, He has moved from village to village, town to town. Friends or companions? For the most part they come and go, depending upon the sway of popular opinion. One day I hear that the people wish to make Him king; the next day I hear that they drove Him from their town. In the surrounding areas the people know Him by many names. Teacher, Rabboni, the Nazarene, the Rabble-rouser, and, among others, the Miracle Worker. I know when He hears that name, He understands that He is usually sought because of His power. Seldom do people talk of His love and compassion, but He would rather be sought because of Himself. After all, His entire purpose revolves around touching people on a heart-to-heart level, giving of Himself. Yet the usual action of those who seek Him is to bypass the Man, desiring only His power, His gifts. For Him, that is a real disappointment, a heartfelt grief, a lonely sorrow. It seems to me that He is merely being used, but there is something that hurts Him more deeply than that knowledge. The real pain comes because He wishes to be more than a 'wonder-worker.' His deepest desire has alway been to be a friend, but one-way friendship is a lonely place. He wants to give Himself, and not merely His power. I have often wondered why the people make it so hard for Him to give Himself. Why are so few willing to become His friend? Why do the crowds disperse when their sick have been restored? Why must He always walk alone? A crowd began forming as people recognized Him and pointed Him out to others. 'Hey, isn't He called the miracle worker?' shouted a man in the crowd. Standing in the center of this commotion, my Son slowly turned His gaze from one face to another. The haughty crowd had formed a circle around Him, and I knew that He suddenly felt intensely alone. This was His hometown. The village where He grew up, where He had worked side by side with many of those who were now jeering. My heart ached for Him as the catcalls and hooting continued. As someone said, 'Hey Magician, let's see You do some of Your tricks here,' I wondered why they hated Him. How could they be so cruel? His greatest desire was to be their friend. Why, then, did they resist Him so? Why did they make it so hard for Him to do that? I felt the sword prick more deeply as I watched Him there. He said nothing in reply, but looked from one heckler to another. Something in His eyes reminded me of sheep I have seen being led to slaughter. My own heart was so heavy that I was about to turn away, when I noticed Him seem to become oblivious to the jostling, jeering crowd. His attention had been drawn towards the hunched figure of an elderly man, sitting with his back against a nearby well. The noise of the surrounding throng faded to dim confusion as in my mind's eye I recalled days gone by. The lonely, hunched figure was that of Shemaiah. Old Shemaiah, His friend, blind from birth. 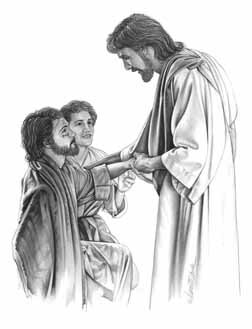 The people of Nazareth were accustomed to the stooped and groping figure of this blind man who had no family or friends. He was usually ignored about town, since most in the sighted world were too busy to befriend an old blind man. But I remembered times when I had seen Jesus as a child watching the neighborhood children softly laughing and pointing as the blind man stumbled over sticks they would place in his path. I remember Him telling me how that the townspeople would mimic the old man's sightless, shuffling walk, and that they would give wide berth when the blind man lay groping on the ground, trying to find his cane after having tripped over an unnoticed stone. From this same window, I had seen my Son rush to the aid of blind Shemaiah, and together they would walk from place to place. They could often be seen traveling together, the sightless one and my Boy. Jesus was the blind man's eyes, and as the years passed, they would spend long afternoons walking side by side in the fields and paths. Jesus told me that Shemaiah would listen gratefully as He would describe the lovely scenes of nature. And I was glad for the deep bond of friendship that developed between them. Now, as Jesus gazed at the solitary figure beside the well, I knew He was remembering the companionship that Shemaiah had provided, the understanding. Shemaiah had accepted Him for Himself, and many times I remember Jesus telling me how He wished there were something we could do to restore the blind man's sight. The crowd became hushed. As all eyes followed Jesus' gaze, they too saw the stooped figure with vacant stare. Many in that crowd could also recall with vivid memory, when a young Boy and an old blind man had walked arm in arm through the fields and paths of Nazareth. Two men from the crowd brought Shemaiah over and shoved him towards Jesus. As the crowd laughed, the blind man stumbled forward, but found himself caught, supported by two familiar arms. I saw him grasp Jesus' broad shoulders and falteringly pull himself to his feet. His wrinkled hands traced the features of Jesus' face, and I knew, as his fingers lightly crossed my Son's cheeks that he would feel a warm moistness trickling from those compassionate eyes. Then He looked at the watching throng, and hesitated a moment, with a wistful look in His eyes. I caught my breath, wondering if perhaps He was going to give sight to His blind friend. Then slowly He moved toward the outskirts of town. The crowd parted, making way as He past. The crowd was in an uproar now, and several men began throwing rocks at Jesus' back as He slowly walked away. A large jagged rock landed forcefully between His shoulder blades, and the impact caused Him to lurch forward onto His knees. I wanted to run to Him then and throw my arms around Him and tell the crowd to go away, but I watched helplessly from my window as He struggled to His feet and continued walking away, without looking back at the jeering, laughing crowd. I looked back out the window at Shemaiah, who remained seated, with his back still against the stone wall of the well. The smile was still on his lips, but a change was visible. The vacant stare was conspicuously absent, and I thought how glad I was that Jesus was his friend! I turned my attention from Shemaiah to the narrow path that ascended the mountain above our town. Far above Nazareth, I could see a solitary figure making His way toward the mountain pass. The sun's rays gave His shadow a lengthy and distorted form. Towering white clouds were scattered across the stretching sky. I saw Him draw His coat tightly about His neck and shoulders as He leaned into the wind and continued walking. Just below the pass He paused and, turning, looked back toward our valley. His face was only an outline but I'm sure there was a broad smile upon it. I saw Him look up into the endless blue heavens, and I know Him well enough to tell you that He was whispering, 'Thank You, Father.' He continued walking then, but just before He crossed the skyline, He turned and waved. And in a small town, where the mountain meets the plain, a mother's heartache was lifted, and an old man gazed in rapture at his first sunset.